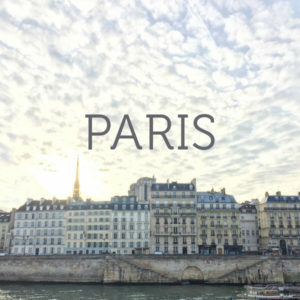 Compared to many people, my autoimmune story was fairly tame and straight forward. There were no epic climaxes in the form of bodily collapses, misdiagnoses, or hospitalizations. My body’s unraveling contained subtler warning signs—the kinds that didn’t always capture my attention. But eventually they added together into the same narrative through line that all of us with chronic illness experience: what the hell is wrong with me? My friend Amie Valpone’s story was on the other side of side of the spectrum. It contained traumas I can’t possibly fathom—a bone marrow biopsy, a cancer scare, and a laundry list of medical practitioners that could fill two corporate softball teams. She tells it beautifully, and with a dash of humor, in her new cookbook and detox manifesto, Eating Clean. 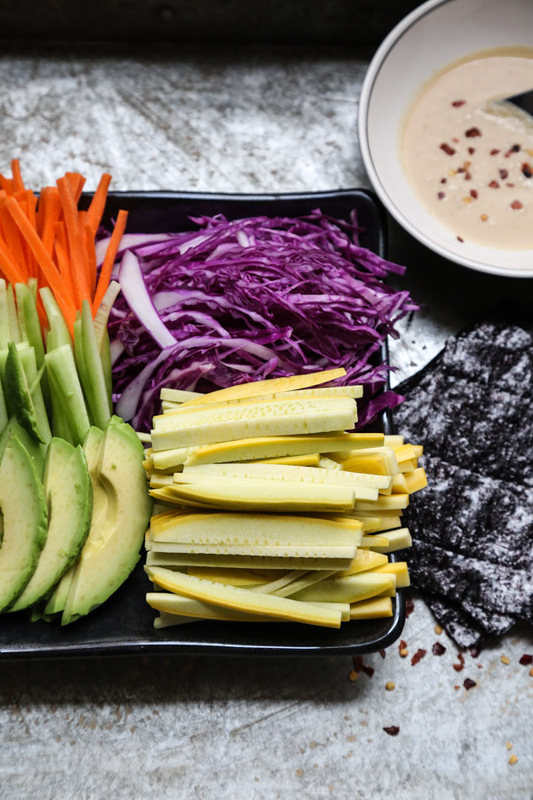 Because of the insidiousness of my symptoms, I had a hard time adopting a cut and dried approach to eating better when I first started sorting through my Hashimotos—even when it came to gluten. Falling off the wagon or unknowingly getting a dose of flour in my food manifested in breakouts, fatigue, and unfortunate tummy troubles. They contributed to a quality of life that wasn’t optimal, but that also was not debilitating. Even today, to some extent, I can afford to be a healthy hedonist. Others, though, can’t get away with toeing the line. Their sensitivities require a whole life overhaul in not so uncertain terms. And for those people, Amie’s book is a complete and invaluable resource. One and done. 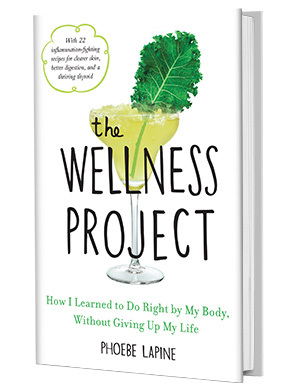 When I first started the Wellness Project, it was Amie who I turned to for advice on which water filter and BPA-free shower curtain to purchase. On which skin care and cleaning products were actually as clean as they claimed to be. And on which fancy new age doodads were worth the money or just a bunch of hooey. I’m so glad that now all of this wisdom is in one place on my bookshelf. As glad as I’m sure Amie is to no longer have me texting her questions about crystal bio mats at 9am. The book is obviously also filled with a lot of recipes—all plant-based and free of gluten, dairy, soy, refined sugar, eggs, corn and processed ingredients. Mine has a high concentration of Post-It tabs on the section about creative gluten-free pizza crusts. 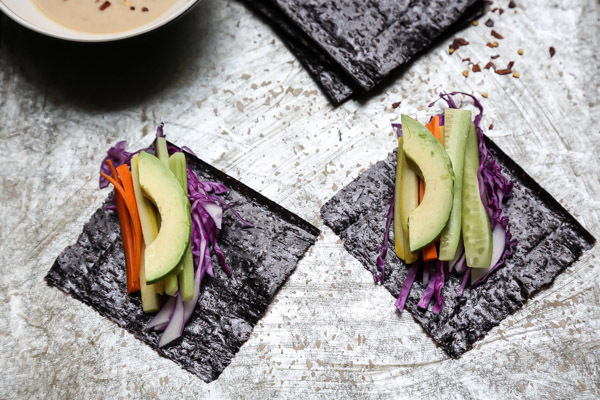 But I was also intrigued by these simple nori wraps, which make an amazing brown bag lunch or healthy snack. Like most of my favorite snacks, they are really just a vehicle for sauce. 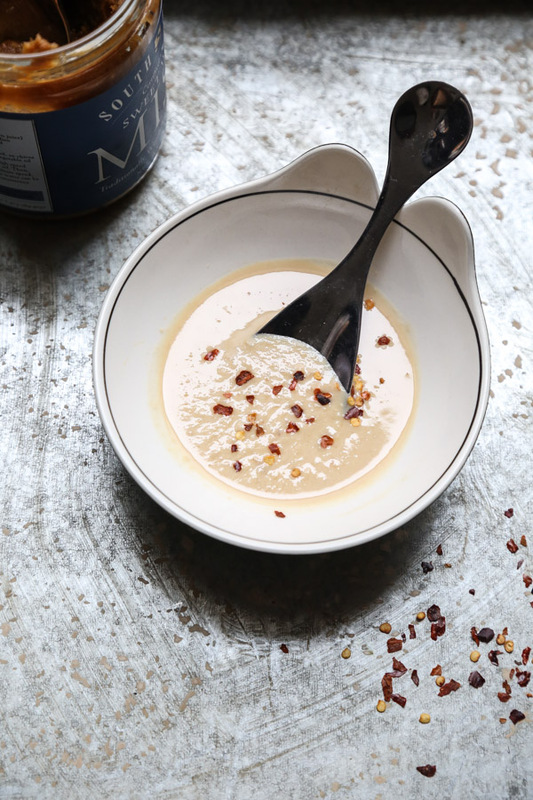 And this spicy tahini drizzle would make any veggie go down easily. The secret ingredient is chickpea miso, which gives the ground sesame a nice hint of sweet and saltiness. I didn’t have it on hand, so I violated one prong of Amie’s detox by adding the soy version. My jar is organic and GMO-free, but I should probably replace it with a chickpea-based brand for future spicy tahini drizzles. Either way though, the sauce is delicious! 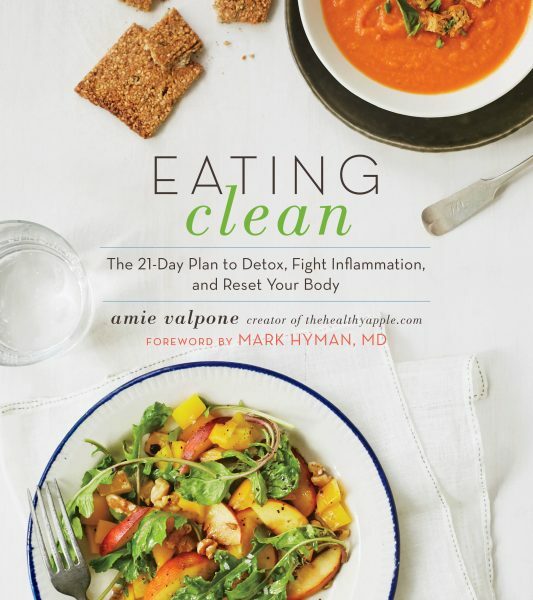 No matter where you fall on the healthy hedonist and clean eating spectrum–whether your illness is a quiet Indie coming of age story or a Contagion-level suspense thriller–I promise there is a lot to learn and cook from Amie’s book. 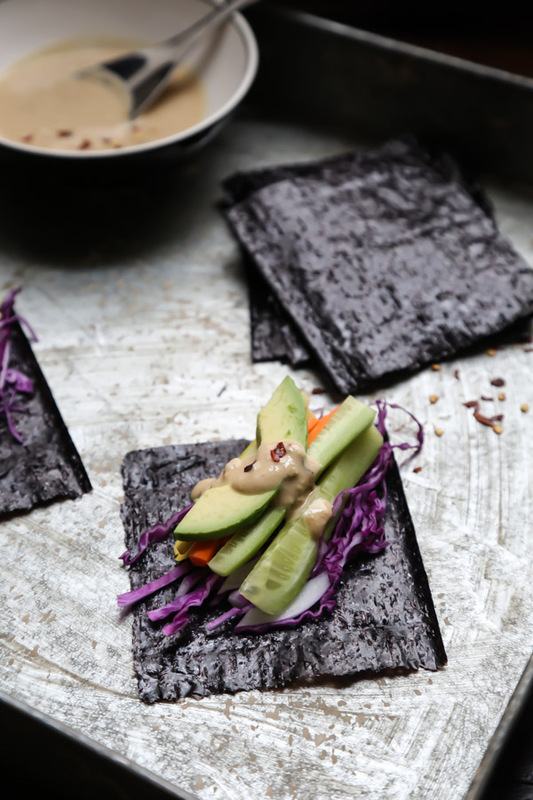 And if you want a little preview, give these Sunshine Nori Wraps with Avocado and Spicy Tahini Drizzle a try! 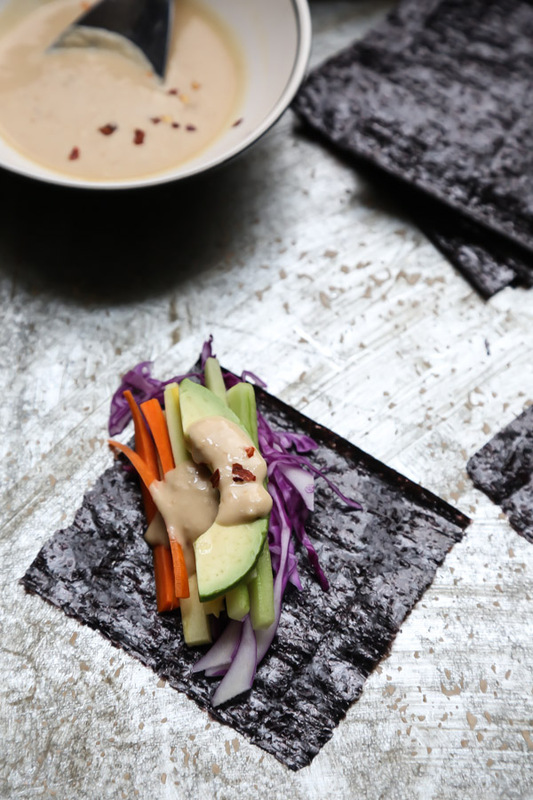 These nori wraps are packed with healthy veggies--avocado, squash, cabbage--and topped with a miso tahini sauce. A great easy snack recipe from my friend Amie Valpone's new cookbook, Eating Clean. To make the tahini: Combine all of the ingredients except the water in a blender. Blend, adding water 1 teaspoon at a time as you go, until the mixture becomes a thin sauce. 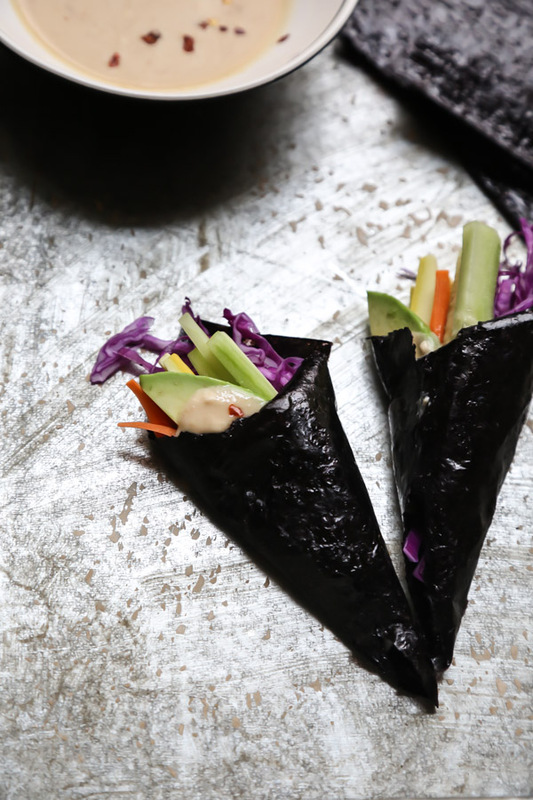 To make the wraps: Place the nori sheets on a flat surface. Add a few pieces of cabbage, carrot, squash, cucumber, and avocado to each sheet. 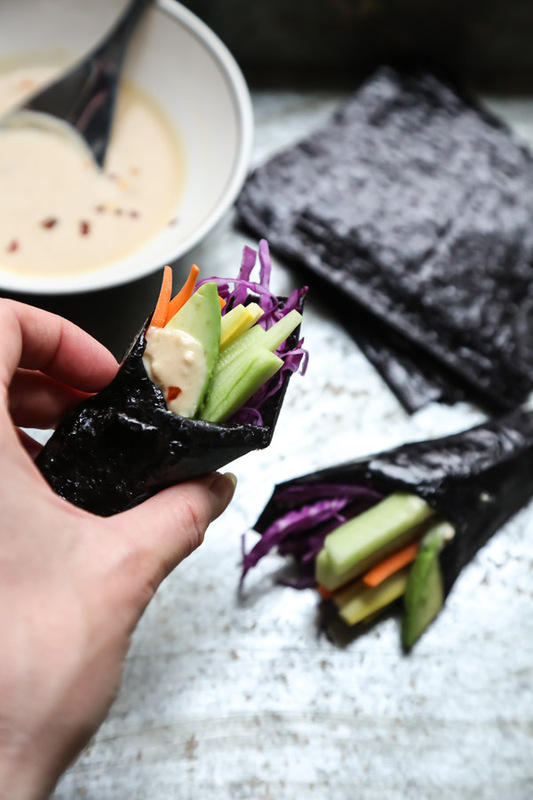 Top each pile of vegetables with a heaping tablespoon of the Spicy Tahini Drizzle, and then roll up the nori sheets into a tube shape. Serve alongside the remaining sauce! If you want the wraps to stick together when you roll them up, wet the sides of each sheet with a little water (you can just use your finger). I laid out my sheets like diamonds and placed the veggie piles vertically. Then all I had to do was tuck the bottom corner and fold the sides in to get little hand rolls. These look great! 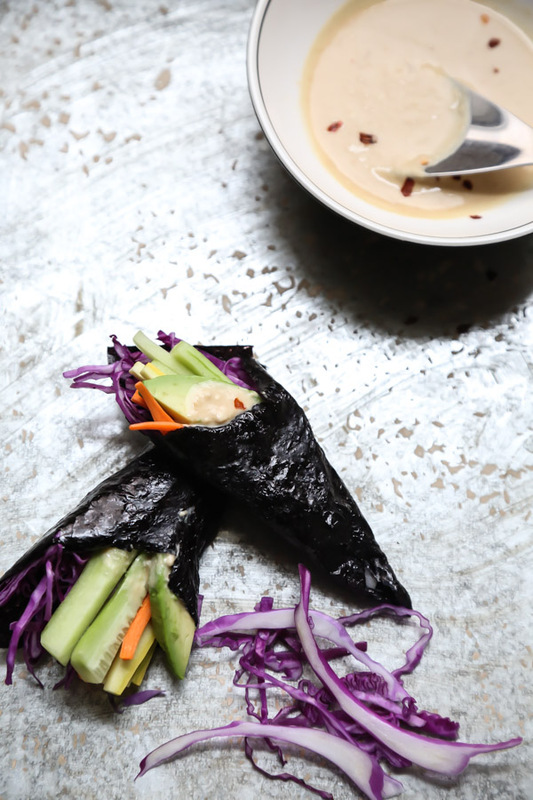 I am normally apprehensive about eating seaweed but I think I could try it with that tahini sauce! hehe – a good sauce makes any healthy food less scary! Thank you so much dear Phoebe! The rest of the seafood is always cooked. The exception is some fishes that may be air-dried and salted, semi-raw. Sardines are the most commonly used in this category. But generally, Greeks eat any meat cooked (and the steaks are always well done, otherwise we get a bit appalled by the view of the blood in the plate). raw oysters are THE BEST!! I never heard of chickpea miso paste. Is that easily findable? definitely! they have in the refrigerated section of whole foods, right next to the regular stuff. 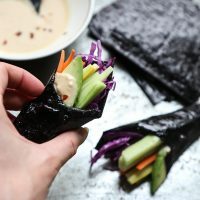 Love making my own sushi at home and I definitely have to try out your recipe, the idea of a spiced tahini dressing to go alongside them is great too! These look so tasty, and I love your photos!! Soooo, I’ve made these about 4 times this last week. Spicy tahini drizzle = life! omg yay!! 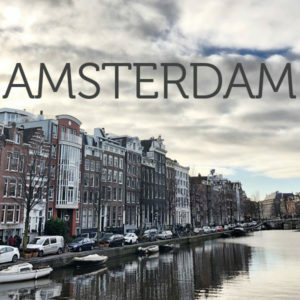 will tell Amie – she’ll be so pleased!